I enjoy reading non-fiction books with my third graders. This book is such a fun way to present animal facts. Each page shows the noses, ears, tails, eyes and mouths of five different animals. The fun starts as students try to guess which nose (ears, tail, eyes or mouth) belongs to which animal. Then, we turn the page and read about how each animal uses its nose, (ears, tail, eyes or mouth). Some of the facts, like monkeys hanging from their tails are not surprising. The fact that horned lizards shoot blood from their eyes….and crickets hear with ears on their knees…..surprising!! Don’t miss this fun way of presenting animal facts to children. Tagged: Children's Book Recommendations, Children's books about Animals, nonfiction picture books, Read Aloud Books, Robin Page, Steven Jenkins, What Do You Do with a Tail Like This? 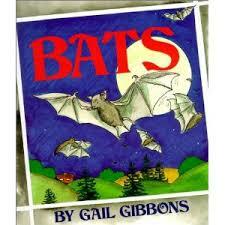 I was looking for interesting science books for my 3rd graders and was happy to find this great book by Gail Gibbons. Gail Gibbons has written over 170 non-fiction books. She is great at explaining concepts in short bursts with careful illustrations. Her book topics are wide-ranging including: trains, tunnels and animals of all kinds. With Halloween approaching and our 3rd graders studying animal adaptations, bats seem like a natural choice for this week. This books begins with general information, including: the fact that bats are nocturnal, that they are shy and gentle, and that they are mammals. It continues information about their body structure, where they roost, their use of echolocation to find food, different types of bats and what they eat. Our 3rd graders were really engaged as I read. The pages provide just the right amount of information for students to absorb while they looked at the pictures and asked questions. We play a game in my library. Our students challenge my co-worker and me to find information about a topic from the books in our library. Yesterday, our students challenged us to find out how bats land upside down. We were able to find some information on our shelves about how bats land. Today, I cheated a little and found a great video on the internet, courtesy of the New York Times, showing how bats defy gravity and land upside down. We are approaching Halloween, and it’s time to find great read alouds for my classes. 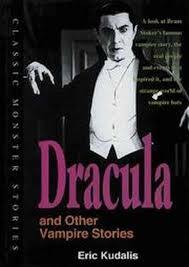 This book recounts the Dracula story from the classic 1931 black and white film. The next chapters include: a short biography of Bram Stoker, the author of Dracula; superstitions about vampires; the stories of the real Vlad Dracula and another ruler of Transylvania, Countess Bathory (gruesome by the way); Vampires in Books and Films; and Vampire Bats. I only read Chapter 1, the story of Dracula to my classes. It was just the right length read aloud, about 10 minutes. You could have heard a pin drop while I was reading. My students loved it. Several students asked if they could check out the book after I read it to them. There is nothing like a good vampire story to get your older students ready for Halloween! Enjoy. Many thanks to Amélie of Amélie’s Bookshelf for recommending this terrific book. It provided a great opportunity to talk to my kindergarten students about authors and illustrators and whether illustrators always had to draw or paint the pictures to a book. In this case, Olivier Toppin has taken photographs of stuffed animals with real props in order to illustrate the book. As I read this to my kindergarteners, they were held in great suspense, some said they were even scared as we read it. Trust me, this is a very gentle book with a kindergarten-sized villain and two really good guys, named Benjamin and Bumper. When Benjamin’s mom goes off to do errands and doesn’t return, Benjamin and Bumper set out to find her. Luckily, they are very practical animals, packing lots of tools that they might need for their search and rescue mission, including: their scooter, ropes, ladders, a sewing kit, a fishing pool and some tools. When they discover that Mrs. Middlemouse has been captured by the terrible Sir Pouncelot, they’ll need all these various things in order to save her from becoming an ingredient in one of his dinner casseroles. Will Benjamin and Bumper be able to save Benjamin’s mom? Will Sir Pouncelot learn a lesson? Tune in to this, the first of the Benjamin and Bumper Adventure series, to find out! This book may be my favorite book of the year. Written by the author of one of my recent favorites for middle and high school, Stargirl, was recommended to me by the students in one of my third grade classes. They’d been read the book by their teacher. I’d been given all sorts of recommendations, Captain Underpants, among them. This one stuck in my mind, because I knew it had won the 1991 Newbery Medal and because I’d always meant to read it. Jeffrey Magee was orphaned at the age of three when his parents’ trolley went off the tracks of the P & W Trestle into the Schuylkill River. Jeffrey moved in with his aunt and uncle who always fought. One day, he ran away, literally. He ran all the way to a town called Two Mills. Two Mills was split by Hector Street. The West End of town was reserved for whites. The East End of town was for blacks. The two populations didn’t mix at all. In fact, no one who was white dared come into East End. Likewise, no one who was black purposely went into the West End of town. Until Maniac Magee, unaware of the rules, showed up in the East End of town. He met a girl named Amanda Beale, a great lover of books. He managed, unbelievably, to borrow a book from her, a girl who did not, as a rule, lend her books. He promised to return it and ended up living in Amanda Beale’s house. There, he had two little brothers, a sister and a mother and father – a home. Maniac Magee was fearless. He could do extraordinary things. He hit home runs off a star pitcher, ran touch downs on the football field, untangled complicated knots, ran on a single rail of a railroad line and actually sat on the Finsterwald’s front steps to read a book. He never went to school but loved to read. He was a maniac. He was legend. All was going well until one day someone pointed out that he was white. Maniac, didn’t even realize it himself. Things changed after that day. People didn’t like that the Beale’s were sheltering him. So, Maniac ran. He ran and found a home at the local zoo, in the buffalo pen. There, he met a true friend, Grayson, who would make him another home in the park. Soon, Maniac had to run again, this time, to the West End and a house where two small boys needed someone who would keep them safe. He was fine there, taking care of those two boys who needed him and for whom he would do anything. Until the day they asked him to do something he absolutely could not do, and he ran again. 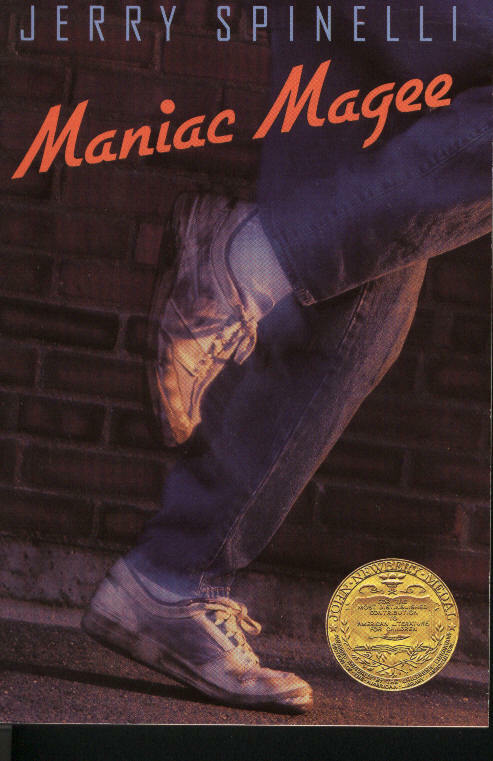 Like my students, I became completely absorbed in Maniac Magee’s story. I hope you will too. 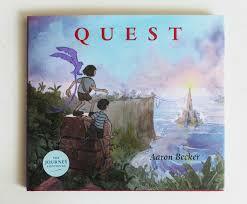 Quest is the incredible sequel to Aaron Becker’s 2014 Caldecott Honor Book, Journey. It, like Journey, is a wordless book with breathtaking illustrations. I particularly like to use wordless books with my fourth graders. They are a restless bunch, usually wanting to talk amongst themselves rather than listen to a read aloud. With a book like Quest, I stand in front of my students and page through the book for them as they “read” it to themselves. Even those students who were reluctant to pay attention quieted quickly. Quest held their attention so well, you could only hear the whispers as they “read” this book and said soft “aahhs” at the beautiful illustrations. At the end, my intractable group smiled and clapped. They loved it! Quest begins at the end of Journey. (To be sure my students understood this, I showed them Journey first and then Quest.) The two children, a boy holding a purple crayon and a girl holding a red crayon, meet a king who gives them a written message, with multiple colors on it. The king is abducted by soldiers and taken away. The boy and girl use their crayons to try to save the king using the clues in the message he gave them. To see if they succeed, read this wonderful book and enjoy. 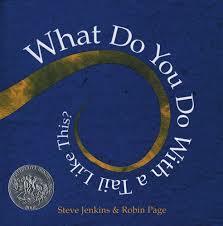 Here’s a great book that worked well with my pre-k through K students. They really enjoyed it. 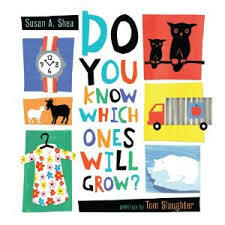 Susan Shea cleverly takes readers from things that are organic and grow and things that won’t grow with rhyming text and unfolding pages. Have fun with this one! Many thanks to my friend, Leona, a story teller at our school, for this wonderful recommendation!